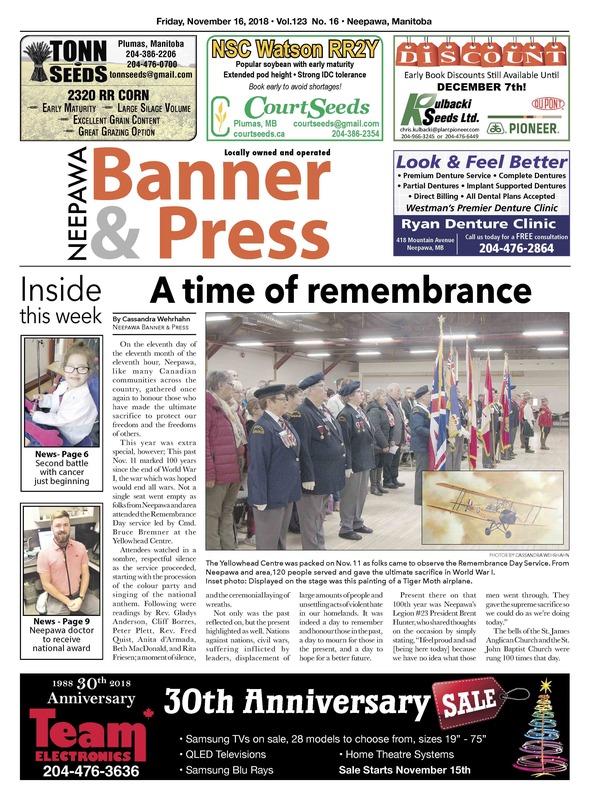 The Neepawa Banner & Press is trying something new to get you the latest local news online. Click on the front page image at the bottom to get a better look at our whole paper for this week or take a look at the booklet below to flip through the pages. 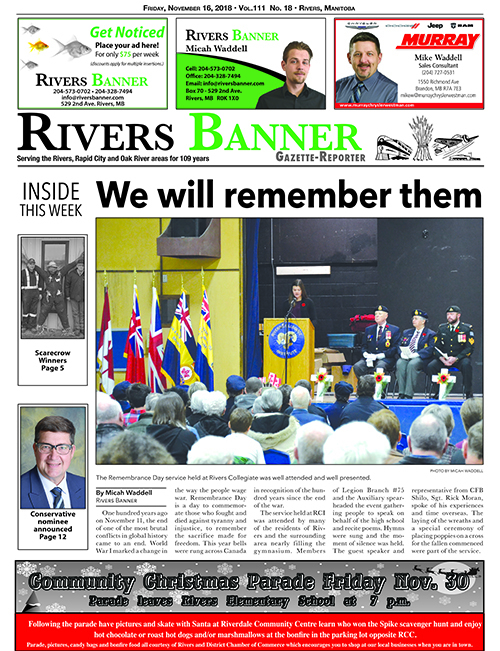 This week, find articles about Remembrance Day services from around the area, a local doctor who won a national award, a young girl battling cancer, the new Conservative representative for Dauphin-Swan River-Neepawa and much more! Don't forget to pick up the hard copy of the Banner & Press so you don't miss out on some great deals in the flyers! In this week's, you can find Giant Tiger, The Brick, Home Hardware, Rona, Bulk Barn and Peavey Mart, depending on where you pick up your paper. The Rivers Banner is trying something new to get you the latest local news online. Click on the front page image at the bottom to get a better look at our whole paper for this week or take a look at the booklet below to flip through the pages. 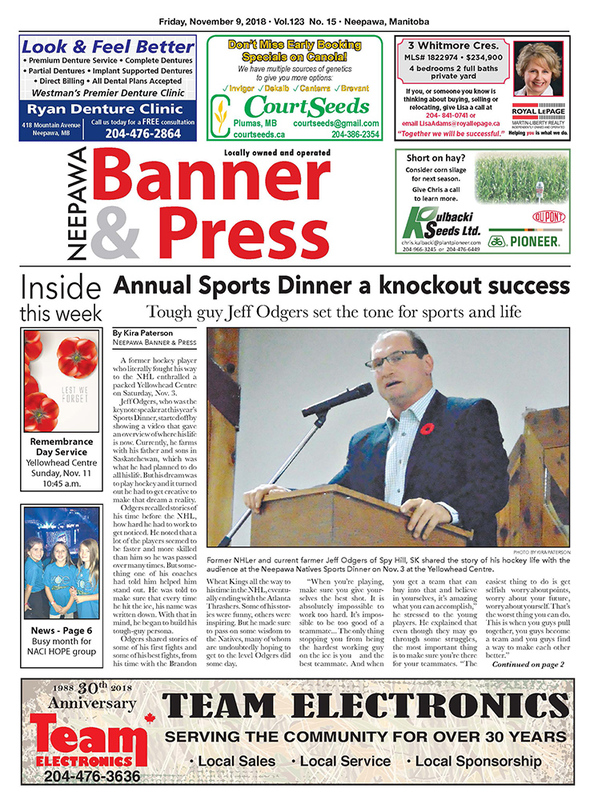 Highlights from this week's paper include Darren Roe as Sportsperson of the year, a busy month for the NACI HOPE group, a Christmas classic coming to the stage, Gladstone's annual Moonlight Madness.... all this and more in this week's edition of the Banner & Press! In more ways than one, the road has not been all that hospitable to the Neepawa Natives so far this season. To go along with a 0-8-0 record in games away from the Yellowhead Centre, the junior “A” club has found itself dealing with transportation issues on multiple occasions. Pictured is William Paterson and his wife Margaret (“Daisy”). The Patersons raised eight children on their farm between Neepawa and Arden. William Paterson (1896-1962) was born and raised in Quebec, however, he spent the majority of his adult life farming in the Rural Municipality of Lansdowne. 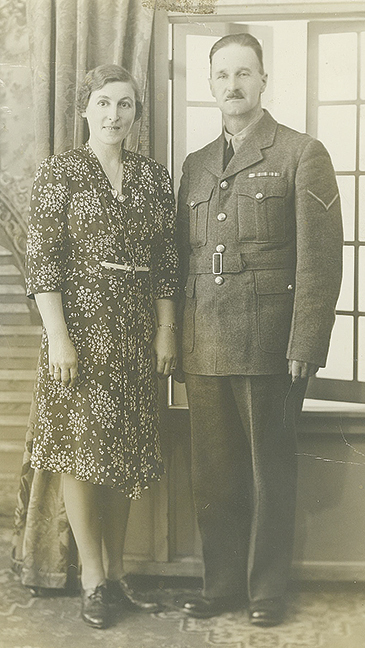 Before moving to Manitoba, he enlisted to fight in the Great War (WWI) and after he moved, he also assisted in the effort during World War Two (WWII). He didn’t speak much of his time in the two World Wars, but it was quite the story to tell.